1943 - From the 1943 release. This stunning lobby card may be the best in not only this set but even compared to the 1937 set of which this scene/image did NOT appear. These 1943 lobby cards are actually more rare then the 1937 release as we have only seen maybe one other one in the past 20 years. Whereas we have a seen a half dozen of the 1937 release cards. A real beauty. Very good condition with some minor smudges on bottom border. 1945 - re-release Half Sheet (22x28") . 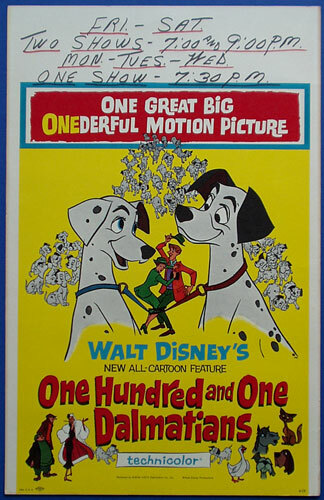 The first release after the 1940 original release. Very few posters from this release have surfaced in the marketplace. Exceptional beautiful colors and artwork! This has been professionally linen backed and looks great!! 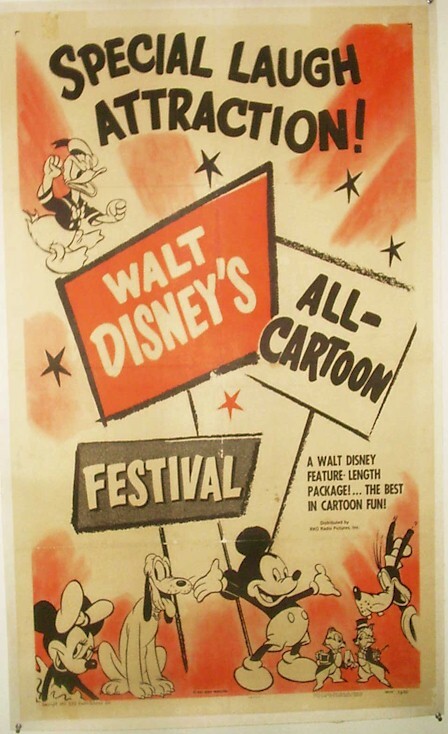 The original one sheet from 1940 sold for nearly $9000. 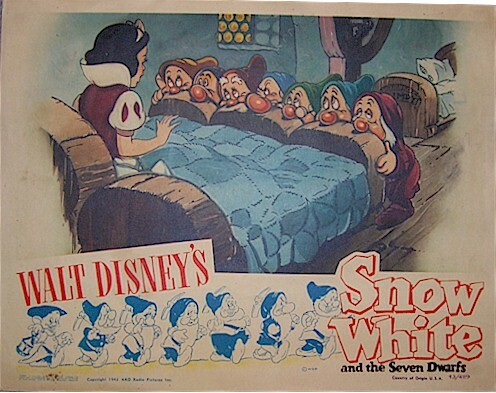 1952 - RARE Original Vintage Disney One Sheet (27x41") movie Poster. Great graphics of Mickey, Minnie, Pluto, Goofy and Donald Duck. ALL the Disney Superstars! Very good condition and has been professionally linen backed. 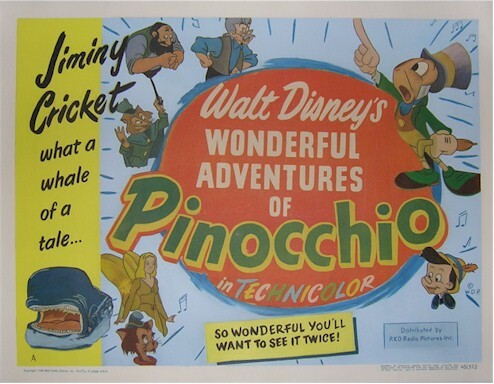 1961 - An exceptionally beautiful ORIGINAL Window Card (14x22") movie poster for this very desirable Disney movie. Unlike most window cards this one has NOT been trimmed at the top. The show times being advertised for the 1961 showings. Poster is in near mint condition. You won't find a better one!! 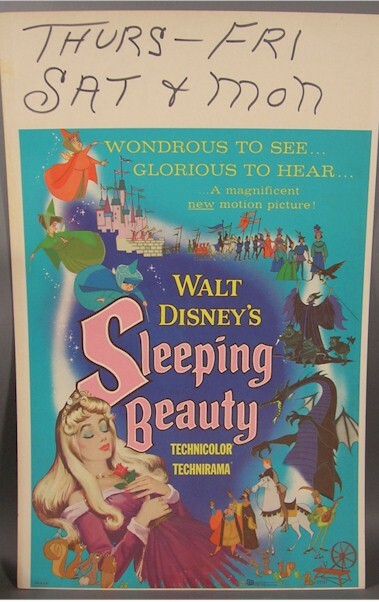 1959 - Original Window Card (14x22) for this Walt Disney classic, "Sleeping Beauty". Excellent + condition . Top has NOT been trimmed like most window cards. 1960 - Original vintage insert (14x30"). Considered even better and more popular then the one sheet because the insert is the only "Sign of Zorro" poster to have a close-up and striking shot of Williams in "Zorro" pose. A real beauty and treasure for the "Zorro" or Guy Williams collector! Excellent + condition with normal studio fold lines. 1960 - Original vintage lobby card (11x14") with great shot of main characters. 1960 - A stunning close-up lobby card scene ! !